FRANKFURT. In the pre-industrial age, twilight was a dangerous time for humans since they were at risk of encountering nocturnal predators. Anyone still able to recognise things despite the weak light was at a clear evolutionary advantage. As neuroscientists at Goethe University Frankfurt have now discovered, the human brain prepares for dawn and dusk by shutting down resting activity in the visual cortex at these times so that weak visual stimuli do not disappear in the brain's background noise. The transition from night to day, light and dark, has a greater influence on perception that we realise. The time of day has a particularly significant impact on the quality of visual signals around us. In the course of evolution, our visual system has adapted perfectly to light conditions during the day. It has, however, also developed a strategy for twilight: Evidently it allows our inner clock to predict these periods and prepare our visual system for times when the quality of visual signals deteriorates. "Whilst the cogs of our inner clock have already been studied in depth, it was not known to date which mechanism optimises visual perception at times when poor signal quality can be expected," explains Dr. Christian Kell from the Brain Imaging Center of Goethe University Frankfurt. 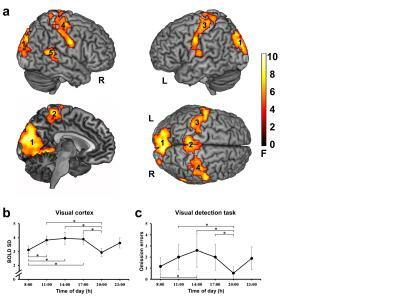 That is why Lorenzo Cordani, his doctoral researcher, examined how 14 healthy test persons reacted to visual stimuli at six different times of the day in the framework of a complex fMRI study. The main idea of the study was to relate the perception of sensory signals to the brain's resting activity. There is namely a certain "background noise" in the brain even in the complete absence of external stimuli. The international team led by Christian Kell, Lorenzo Cordani and Joerg Stehle was able to show that the body independently downregulates resting activity in the sensory areas during dawn and dusk. The more resting activity was reduced, the better the test persons were able to perceive weak visual signals when measured afterwards. This means that humans can perceive weak visual stimuli during dawn and dusk better than at other times of the day. In other words: During twilight, the signal-to-noise ratio in the sensory areas of the brain improves. Since resting activity during twilight decreases not only in the visual but also in the auditory and somatosensory regions of the brain, the researchers assume that perception sharpens not only in the visual system. An earlier study already showed that weak auditory stimuli during twilight were perceived better. The mechanism now discovered, which was published in the latest issue of Nature Communications, could therefore represent a key evolutionary advantage that ensured survival in the pre-industrial era.